Nuclear and germ warfare have reduced America's amber i waves of grain to a savage wasteland. Amid a world of smoldering ruin, few men have the awesome courage or specialized skills to fight back, to rebuild. 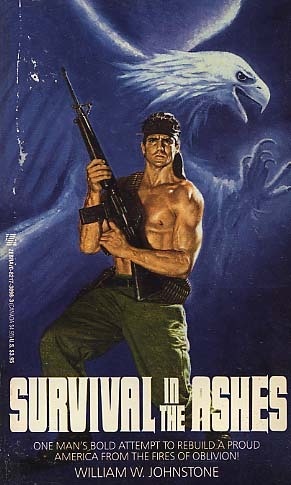 Ben Raines, famed soldier and survival expert, is one such man. And with his ragged band of like-minded Rebels he's waging a war to restore America to its former glory. Raines and his freedom-fighting guerrillas are camped along the banks of what was once the Mississippi River, plotting strategy and readying weapons. A massive pack of heavily armed troops looms on the horizon, marching straight for the Rebels. They are the insidious mercenaries of Kenny Par and Lan Viller, and by midday only the Mississippi separates Raines from the ten thousand blood-hungry warriors all sworn to turning the Rebels's dream into a hellish nightmare. Just as Ben formulates a brilliant battle plan, a Rebel scout reports that the fanatical assassins of Sister Volenta's Ninth Order, are approaching from Ben's back. The Rebels will be surrounded by freedom's deadliest foes. A defeat for Raines means the end- of the Rebel dream--and an America reborn!